There are guests coming tomorrow, and as usual I had no clue about what to make. I scoured my pantry and found a bag of macadamia nuts, just waiting to be used. I made walnut pesto yesterday, and I didn't feel like making another pasta and pesto dish. As they say, variety is the spice of life. 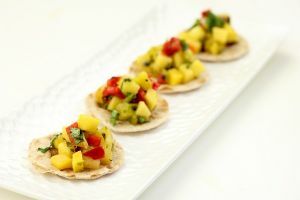 I think appetizers are perfect for dinner parties; they allow people to nibble without interrupting the flow of conversation. I often make some sort of mini puff pastry, and I thought a macadamia pesto would be the perfect filling. However, a traditional pesto would be too thin on its own, so I added some homemade crème fraîche and some goat ricotta cheese. As you may have noticed, I'm a huge fan of goat ricotta cheese, and I get it whenever it's available at the local creamery. Today, I made the pesto and the dough, tested out and baked a couple of puffs in the oven for tasting. The smell was intoxicating, and it was really difficult to snap a couple of photos before everyone descended upon them. You can freeze both the pesto and the dough. If you often have last minute guests as we do, it's easy to pop them out of the freezer and bake them. Your guests will love them, and you'll be a rockstar without much effort! Reserve about 1 tablespoon of butter for greasing the molds. Lightly oil the bowl of your food processor with a silicone brush. Then mix the flour, salt and 4 tablespoons of diced cold butter. Add the cold water and vinegar and pulse until the dough is formed. Do NOT over-mix. Transfer the dough to a large bowl lined with plastic wrap and encase the dough with it. Chill in the refrigerator for 30 minutes. Roll the dough into a 10-inch square. Place the remaining blocks of butter between 2 large sheets of parchment paper. Roll the butter into a 6-inch square. Place both squares of butter of square of dough in the refrigerator for about 20-30 minutes. If you don't have time, place in the freezer for 15 minutes. Place the square of butter onto the dough so that the corners of the butter are rotated 45° away from the corners of the dough. In other words, the butter should look like a diamond placed inside of the square of dough. Fold the corners of the dough in towards the straight edges of the butter. The butter should be totally enveloped. Roll the dough using a rolling pin into a long 18" x 6-inch rectangle. Fold the dough into thirds and roll one more time re-creating an 18" x 6-inch rectangle. The puff pastry dough is ready. Create 1-1/2-inch puff pastry disks. Stack the disks, placing little squares of parchment paper between them. Chill in the refrigerator until you're ready to assemble the appetizers. For the macadamia nuts: To release all the flavor and oil of the nuts, roast the macadamia nuts in the oven for about 10 minutes at 325°F before using them. Chop the nuts. Grind the roasted macadamia nuts in a food processor or spice grinder. Make sure you stop before it turns into macadamia butter. Set aside. For the basil: Wash the basil. Quickly blanch it for about 5-10 seconds in boiling salted water and transfer to an ice bath, to maintain a bright green color. Drain thoroughly of all water and pat dry on paper towels. Coarsely chop the basil. For the basil-macadamia pesto: In a blender (or a mini-food prep if you have one), mix the basil, ground macadamia nuts, canola oil, macadamia oil, garlic, fresh thyme, lemon juice, 1/2 teaspoon of salt and black pepper. Add about 2 tablespoons (or more) of milk for a smooth flow. For the herbed macadamia cream cheese: Transfer the basil macadamia pesto into a bowl. Add the crème fraîche and goat ricotta cheese. Mix well using a spatula. 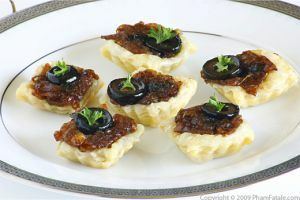 Assembly time: Place the disks of dough into individual mini-tartlet shells previously buttered (or in one 9-inch pie). Add about 2 teaspoons of the herbed macadamia cream cheese to the molds. Bake for 20-22 minutes until puffed and slightly golden. Remove from the oven; repeat until all the dough is used. To make flaky dough, it's important to use cold diced butter. I usually use store-bought puff pastry dough from the Iranian store. I know what you're going to say: Why the Iranian store? Often, I have found that the puff pastry dough sold at local chain stores is made with hydrogenated oils instead of butter. At the Iranian store, it's always made with butter. I think it's safer to make your own. Today, I didn't have any puff pastry dough left in the freezer and no time to run to the grocery store, so I made it the quick and easy way. I hope I didn't offend any pastry experts! This took me 1 hour, tops while multi-tasking and preparing other savory appetizers. You can either buy ready-made macadamia powder, or make it yourself. I use the VitaMix Dry Blade Container to grind the nuts. The result should be a fine mill. You can also use a food-processor or a mini-prep if you have one as well. 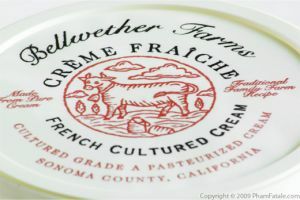 Crème fraîche is quite high in calories. You can substitute Fage or Greek-style yogurt if you're health-conscious. It may alter the creamy, rich taste and the texture might be thicker; if so, just add a little liquid to thin the sauce (milk or water). Another possible substitute for crème fraîche is sour cream but I find the texture and taste to be different. I always make my own crème fraîche with the left-over heavy cream from all my baking. 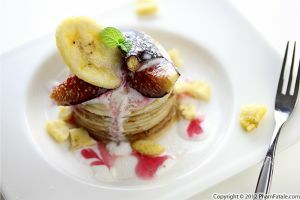 Just click on the link at the end of the post for the super-easy recipe. I bought goat ricotta cheese at a local store, called the Milk Pail Market. The address is 2585 California Street, Mountain View, CA 94040, but you can order online if you can't find it online, simply substitute regular cow's ricotta cheese. The thyme is not essential to this dish; I just like adding it to flavor the butter. The key to good puff pastry dough is good quality yellow butter. I know it's going to sound weird, but I always try to keep good quality French butter in the freezer for making pastries. 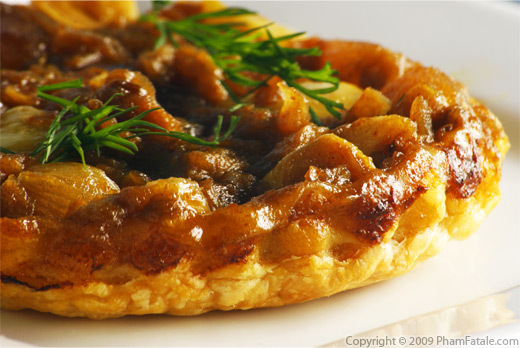 The white vinegar prevents the puff pastry from getting black dots and changing color over time. You can create a large pie if you don't have small molds. I bought non-stick petit four pans at Williams-Sonoma. It's a set of thirty with 5 different shapes. In general, I prefer making miniature versions. The petit fours make my guests feel less guilty, which means they always ask for more. 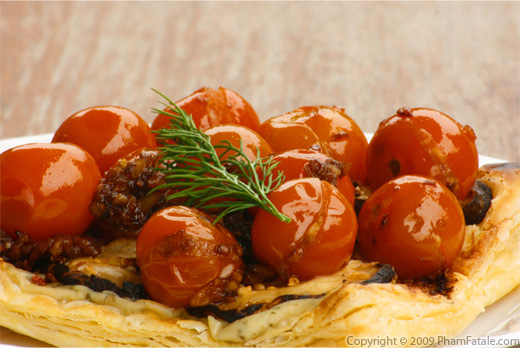 Don't discard the remnants of puff pastry. Make some cheese twists the next day! 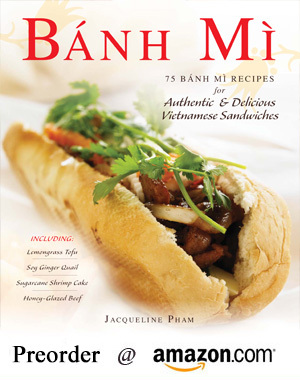 Published By: Jacqueline Pham on September 16, 2009.
nice recipe for a nice puff! These look delicious, Jackie! I've yet to try goat cheese ricotta, but I suppose I could make some - we have several suppliers of goat's milk here. BTW... I responded about the bread contest - my problem is that I base most of my breads on the methods of Zoe Francois and her partner, so I'm not sure they qualify as "mine" - I might see what I can do to switch them up, though. They look wonderful. Your guess are going to be thrilled. OH, and I want to be a rock star. You are the queen of great presentation. And flavor combos. Love this one for sure.